Investment casting is commonly known as the lost wax casting process. It got its name because of the fact that ancient Egyptians used it to make gold jewelry hence the name Investment.Investment casting is popular because very intricate shapes with high accuracy can be made in this process. Besides, when metals which are hard to machine or fabricate can be investment cast.Also, parts with complex shapes that cannot be produced by normal manufacturing processes like turbine blades, or components that needs to withstand high temperatures could be made in this process. Stainless steel metal is a versatile material offering corrosion resistance, strength, good pricing, and a wide range of shapes. Stainless steel is generally formable and weldable, making it a popular choice for investment casting. Austenitic: Austenitic steels have austenite as their primary phase (face-centered cubic crystal). These are alloys containing chromium and nickel (sometimes manganese and nitrogen), structured around the Type 302 composition of iron, 18% chromium, and 8% nickel. Austenitic steels are not hardenable by heat treatment. The most familiar stainless steel is probably Type 304, sometimes called T304 or simply 304. Type 304 surgical stainless steel is an austenitic steel containing 18-20% chromium and 8-10% nickel. Ferritic: Ferritic steels have ferrite (body centered cubic crystal) as their main phase. These steels contain iron and chromium, based on the Type 430 composition of 17% chromium. Ferritic steel is less ductile than austenitic steel and is not hardenable by heat treatment. Martensitic: The characteristic orthorhombic martensite microstructure was first observed by German microscopist Adolf Martens around 1890. Martensitic steels are low carbon steels built around the Type 410 composition of iron, 12% chromium, and 0.12% carbon. They may be tempered and hardened. Martensite gives steel great hardness, but it also reduces its toughness and makes it brittle, so few steels are fully hardened. When you have a deeper understanding on investment casting, you will know investment casting is a generic terms for small precision castings. Accurate process for stainless steel components by investment casting is silica sol casting method. Silica sol method dewaxes into the flash fire, and silica sol zircon sand makes the ceramic mold. Silica sol method costs more but has the better surface than water glass casting method. 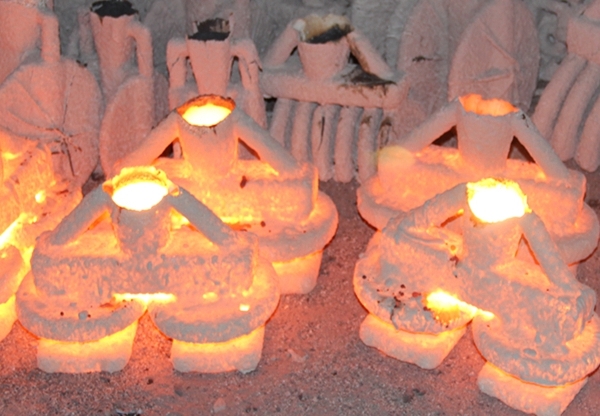 Silica sol casting method dewaxes into the flash fire, and silica sol zircon sand makes the ceramic mold. Silica sol casting costs more but has the better surface than water glass casting method. Redesign Service: Sometimes, the designers are not familar with investment casting process, so the sizes and shape are not feasible for actual production. On this occasion, our engineering department will redesign the structure. Extensive Secondary Operations: Secondary operations performed at CFS Investment Casting include machining, heat-treating, passivation, ect. Wide Selection of Stainless Steel Alloys: We frequently cast a wide variety of stainless steel alloys, including: 304(L) stainless steel, 316(L) stainless steel, PH17-4 stainless steel, ect. Competitive Price: For our semi-automatic equipments and strong engineering team, we can always produce stainless steel investment castings in a most cost-effective way. And due to our advantages of geographical location and low labor & material costs, we can always offer quality products with competitive prices for our customers. Start with a reasonable size casting. Bigger projects are harder and can take longer periods. Start early: Due to the multi steps of investment casting process, it will take a long time to develop a new product, and castings don’t always come out easily at the early step, so it is better to start the purchasing procedure early. When sending a RFQ, kindly mind that you should make sure the company can make stainless steel parts ,especially for stainless steel ph17-4. Would like stainless steel casting service in China? Get in touch with us!